After last month’s discussion of Captain Kronos – Vampire Hunter (insert the Captain Kronos opening theme stinger here! ), the Down Placers continue their look at 1970s Hammer Vampire films by taking a good hard look at Ingrid Pitt in the first installment of the Karnstein Trilogy, The Vampire Lovers (dir. Roy Ward Baker). This film is one of Casey’s Top Five Hammer films. Derek has seen bits and pieces of the film over the years. Scott is watching it for the first time. They may have differing opinions about the film, but they all agree on one thing – Peter Cushing is amazing. 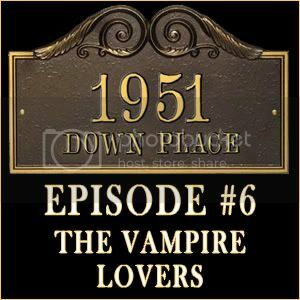 Download 1951 Down Place: Episode #006 here! Brosnan, John. The Horror People. New York City, NY: The New American Library, 1976. Print. Hallenbeck, Bruce G. “The Making of The Vampire Lovers.” Little Shoppe of Horrors Magazine. Aug 2004: 26-34. Print. Hammer Horror – A Fan’s Guide. Dir. Rorie Sherwood. Duke Video, 2008. DVD. Larson, Randall D. Music From the House of Hammer: Music in the Hammer Horror Films 1950-1980. Lanam, MD: The Scarecrow Press, Inc., 1996. Print. Legends of Hammer – Vampires. Prod. Don Fearney. FGS Productions. 2008. DVD. Masters, Tim. “Actress Recalls Glamour of Hammer.” BBC News. 30 Oct 2009. Web. 28 Feb 2012. The Vampire Lovers (DVD Commentary). Dir. Roy Ward Baker. Perf. Ingrid Pitt, George Cole, Peter Cushing. MGM, 2003. DVD. The Vampire Lovers. Dir. Roy Ward Baker. Perf. Ingrid Pitt, George Cole, Peter Cushing. MGM, 2003. DVD.